This web page starts here. One of the main things I do, of course, is tune the piano. Throughout most of the piano, every note has three strings, each attached at one end to its own tuning pin which can be turned slightly to tighten or loosen the string. For 22 years I used the old fashioned "aural" method of tuning - starting by tuning the note C above middle C to a tuning fork, then tuning the rest of the notes to that by listening carefully to the beats in the intervals of 4ths, 5ths, and octaves. 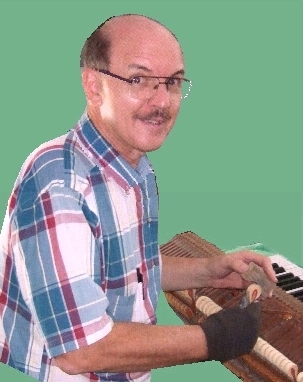 Many customers ask me, "How often should I have my piano tuned?" There is no one answer that fits everybody. Pianos which have tuning pins that are tight will generally hold their pitch better than pianos with somewhat loose tuning pins. Tuning pins become loose with age, with frequent humidity changes, or if the pinblock is made of inferior quality wood. Pianos that are played frequently or heavily will need tuning more often than those that are played infrequently or lightly. A piano that is moved around a lot will generally need more frequent tunings than one that stays in the same place. Pianos in a well controlled climatic environment will stay tuned longer than those in places where temperatures and humidity change often. As a rule of thumb, I recommend to my customers whose pianos are played a couple of hours a week or less that a tuning once a year is generally sufficient, assuming other factors are favorable. To those whose pianos are used more, twice a year may be necessary. A new piano will require more frequent tunings in the first two or three years until the strings, wood, etc., have stabilized. When servicing your piano, if I see that the keys have not been kept clean, I may ask you for a bowl of water, about a pint, into which a few drops of dish washing liquid has been added. Then, moistening a clean cloth with this solution, I will wipe off the keys. You should do this every once in a while, especially if children have not been accustomed to washing their hands before playing the piano. You may want to add a bit of disinfectant to the water. The outside of your piano should be dusted occasionally, as you would any fine furniture. Any good quality furniture polish can also be used, only do not spray directly onto the piano, as some of the spray could get inside and corrode metal strings or other parts. I also offer a specially made piano polish. Generally speaking, a piano should always remain closed except when actually in use. Avoid placing vases of flowers with water in them on your piano. Not only is there a danger of water spilling and rusting the strings or other parts, but leaves sometimes drop into the piano action causing strange noises or even malfunction. I always check for foreign objects when I open up the piano for tuning. Even with the best of care, eventually dust will settle into the action and under the keys. If your piano has not been vacuumed out under the keys in the last 15 years, it will probably need to be. Removing the keys and action, vacuuming the keybed, cleaning the keys, and replacing everything again, will generally take about 3/4 hour. Pianos that have come from storage, or from unknown sources, may even harbor cockroaches or mice. Removing the keys of a piano for cleaning sometimes reveals some surprises. Dust that settles into the copper windings of the bass strings will cause the strings to sound dead. There is really no satisfactory way to remove the dirt in the windings unless they are removed. Even then, only partial restoration of their original sound can be achieved. If bass strings are too dead, they may need to be replaced. For the best protection of grand pianos, I highly recommend the purchase of a String Cover. Piano repairs can be very tricky. There are over 200 makes of pianos in use today, each one with some peculiarities. Piano parts suppliers try to keep an adequate stock of the more frequently used items as well as generic items that can be used on most pianos, even though the original manufacturer may no longer be in business. Sometimes an older or rare piano may require the skills of an expert machinist to remanufacture parts that are no longer stocked. As a member of the Piano Technicians Guild, by means of regular meetings, annual conventions, and a monthly technical journal, I am constantly being updated on different procedures for all kinds of repairs. It is always interesting to attend a seminar on some particular aspect of piano technology. I strive to keep current on the latest techniques and products in order to better keep your piano in proper operating condition. In addition to its need for regular tuning and occasional repairs, a piano's action has numerous adjustment points that must be properly regulated in order for the keys to correctly operate the hammers that strike the strings. 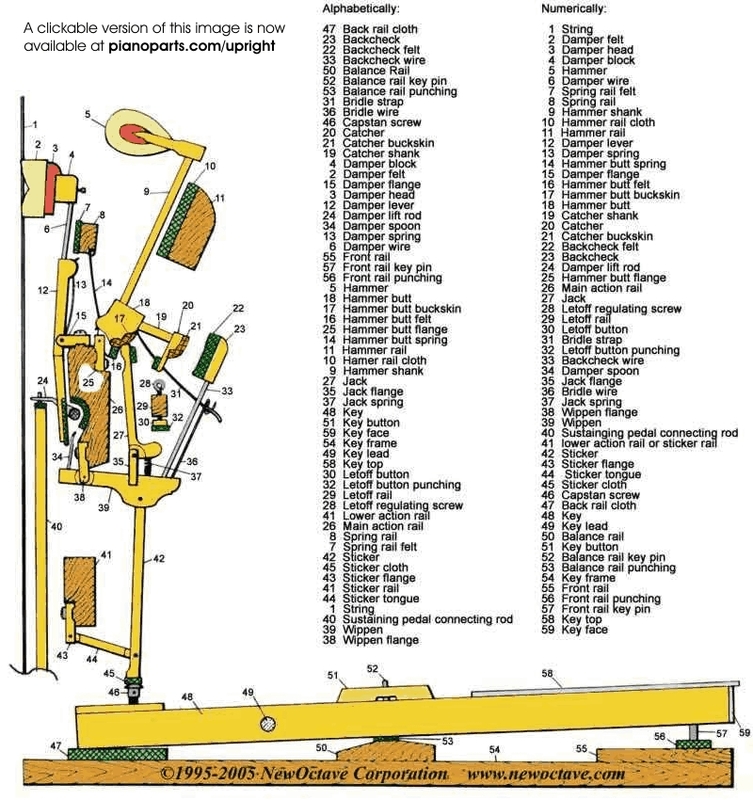 These are adjusted at the factory before the piano is sold, but over the years, as things wear down with use, minor adjustments must be made if the piano is to operate at its peak. A poorly regulated piano, just like an out of tune piano, can easily discourage any budding pianist from wanting to practice. I would be happy to show you where these regulation points are when I service your piano. The term "voicing" refers to work done to the felt material of the hammers that strike the strings. When hammers are properly voiced they will produce a pleasing sound when they strike the strings. Manufacturers of piano hammers use varying grades of felt material, some harder, some softer. Between different pianos, even of the same make and model, there may be a variation in the loudness due to the hammer felt hardness. Hammers that are too soft will not produce a loud enough sound. But they can be hardened by the application of a special hardening compound. Hammers that are too hard will produce a harsh sound. They can be softened by the use of a tool with needles which helps break up some of the compactness of the felt. The application of steam is another method often used to soften the hammers for a more pleasing, mellow sound. Pianos that have had heavy use may develop deep grooves in the hammers where they hit the strings. These grooves must be filed out and the original contour of the hammer head restored before they can be properly voiced. (Picture) Just the filing and contouring may in itself be enough of a change so that no additional voicing is necessary. As an optional method for reducing the loudness of the piano, instead of voicing the hammers, I can install a mute system. This consists of a rail with a strip of felt material which, when engaged, comes between the hammers and the strings. This is especially useful if you must play the piano in an environment where it might disturb others, such as in an apartment. Through my contacts with other Piano Technicians all over the country who have large and specialized shops, I am able to sub- contract out these jobs and offer you exceptional value and quality. Call (561) 432-4121 today to schedule an appointment! For more information about tuning and servicing your piano, please be sure to see The Piano Page, sponsored by the Piano Technicians Guild.